Thatgamecompany hopes Journey's online mode will eliminate the problem of foul-mouthed 12-year-olds once and for all. The reveal of Thatgamecompany's Journey trailer proved that it was gorgeous, but gameplay details are still somewhat sparse. According to creative director Jenova Chen, that's the whole point, but don't worry. He says the game is being designed "for humans," and it might even change your perception of playing games online. In an interview with 1up, Chen lambasted the state of multiplayer in the videogame industry as overly complex. "When I think about online games, I'm thinking about latency, I'm thinking about creating a lobby, inviting a friend, waiting for them to confirm," he said. "Then start the game, create a password so other people can't enjoy, coordinating times so we can all play together. I think that's too much baggage." "Why should a kid understand what a lobby is," he wonders. Another big problem Chen has with online gaming is the often unnatural interaction between players. He continues: "One thing about playing games online, the big problem I see today, is you run into a kid and he's saying dirty words ... and it's not pleasing ... There is this impression that random Internet play is kids with dirty words or nerdy guys drunk." Chen says a more intriguing way to design a multiplayer game is not so players can be "Leroy Jenkins" or have a "different hat," but to try to change players' impressions of meeting other human beings on the internet. When Chen says Journey is designed "for humans," he means that it doesn't have an external interface if you want to experience its online features, and the online mode itself is more "like life." In Journey, Chen reveals: "You might run into [another player] and really enjoy their company. And then you might break up with them. And maybe later you will rejoin again. Just like our life paths, we run into people. We have a boyfriend, girlfriend, it might work out. It might not. I think it is more like life." When people meet new acquaintances, they usually don't curse them out and shoot them in the face, or let them onto their helicopter only to fly it into the side of a mountain. Chen's found that in Left 4 Dead people would often kill him for his medical pack, when the game is supposed to be about surviving together. Journey is a game that doesn't force companionship, so Chen believes it'll generate a "true connection." If you stay with another player, it really means something. 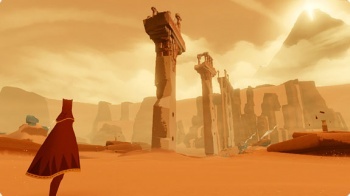 Journey doesn't have a release date yet, and is only planned as a downloadable title on the PlayStation Network. It'll be interesting to see the kind of online experience it can give us that might differ from what has been done before. I have a feeling that even in a game like Journey, someone will find a way to teabag someone else.